In stock 204 items in stock. 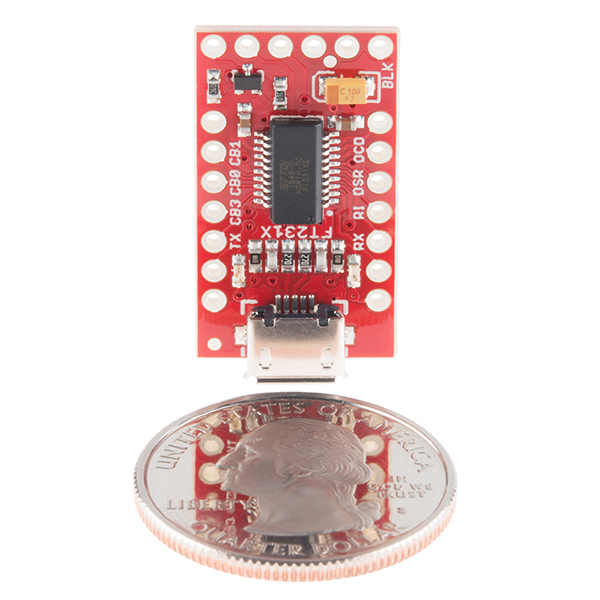 Introducing the SparkFun FT231X Breakout board, complete with the full UART hardware handshake feature! The pin-out of this board matches the FTDI cable to work with official Arduino and cloned Arduino boards. It can also be used for general serial applications. This board still brings out the DTR pin as opposed to the RTS pin of the FTDI cable. The DTR pin allows an Arduino target to auto-reset when a new Sketch is downloaded. This is a really nice feature to have and allows a sketch to be downloaded without having to hit the reset button. 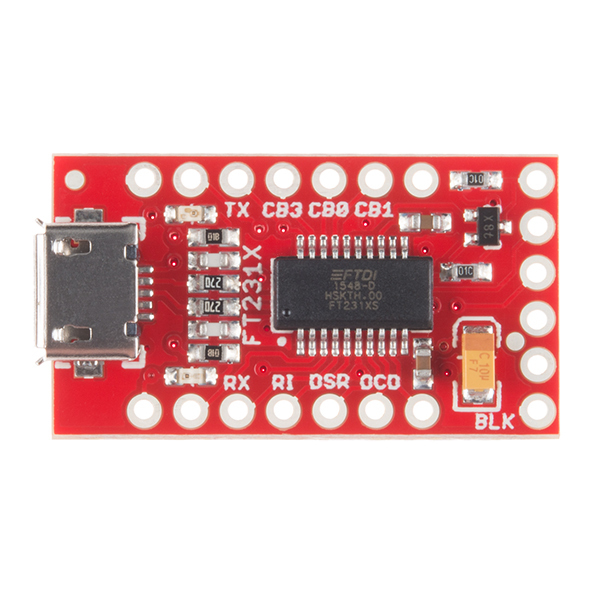 This board will auto-reset any Arduino board that has the reset pin brought out to a 6-pin connector. The coolest thing about the FT231X Breakout is that we have broken out ALL the pins for your use, making this board all the more hackable! It also uses a common microUSB jack. 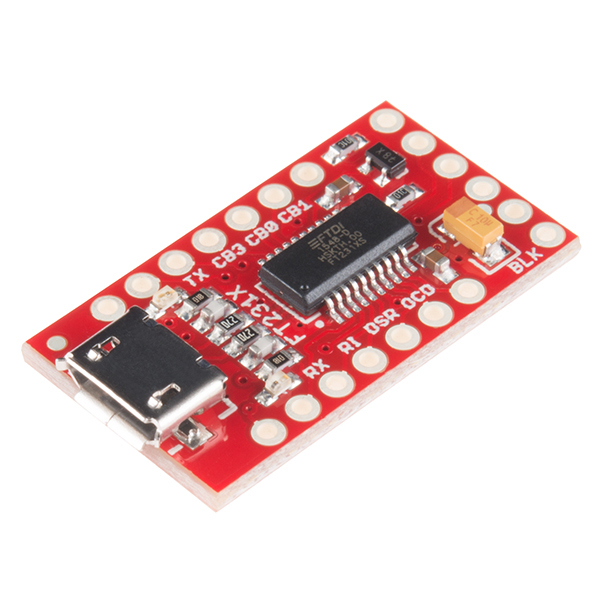 One of the features of this board is a jumper on the back, which allows the VCC output to be configured to either 3.3V or 5V. This board ships default to 5V, but you can cut the default trace and add a solder jumper if you need to switch to 3.3V. It should be noted that the max input of the FT231X is only 3.3V, but it can operate down to 1.8V with external pull-ups and is also 5V tolerant. Parral Dev Board is an open source protoboard-friendly development board based on the powerful P8X32A 8-core 32-Bits microcontroller. Well, I'm confused. 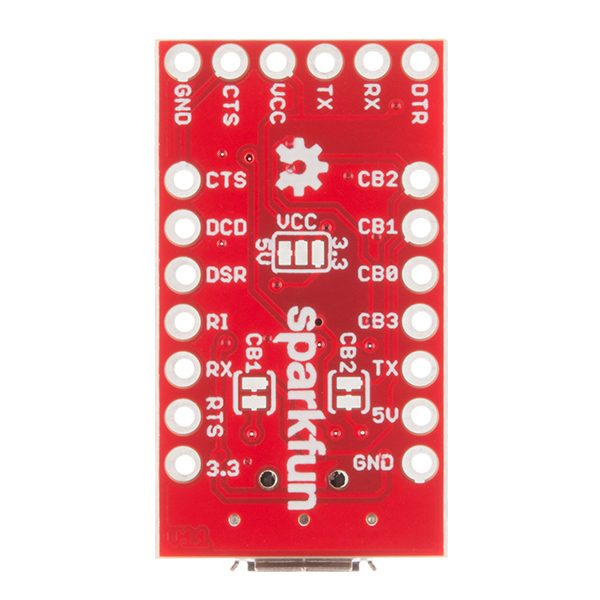 You say "3.3V SparkFun FT231X Breakout board" and then "One of the features of this board is a jumper on the back, which allows the VCC output to be configured to either 3.3V or 5V. This board ships default to 5V". Can this be used with a 5V Pro Mini? This board does come configured as 5V but can be modified to be 3.3V. Additionally I've never had an issue programming a 5V Pro Mini from a 3.3V FTDI. While technically the chip is out of spec at 3.3V/16MHz we actually sell a product that runs at that without an issue. Unless connected components require 5V everything should work fine. Thanks for the heads up, we've updated the description. I'm confused. According to the schematic the ONLY thing the 3/5 volt jumper changes is the level converter output for the reset/DTR signal. The tx, rx, cts, and other signals remain at 3.3 volts. Why? What changed between this one and the last one? Based on the two products' images and earlier comments/complaints, this one probably has a stronger Micro USB terminal-to-board connection. The obvious physical difference is that this board's length has increased slightly (likely to allow more durable connector-board interface, as the USB area is now enlarged). Output pin dimensions appear to be unchanged. What would be great is a chart of all of these types of breakouts you offer and the differences. Thanks. I think Bob is just talking about a comparison of USB/UART adapters. After all, you do have this and 7 other s not counting 11736 that this product is replacing...and these are just the ones I could quickly find: 9716, 9873, 10275, 12731, 12935, 13746, 11814. Title says it all really. I use it with several Arduino Mini Pro's and it just works like you expect it too. Worked perfectly right out of box! I first purchased a cheaper FTDI from another vendor and wasted a lot of time trying to make it work without success. I finally realized it was not the user but the hardware. I figured it out by reading other comments where many were found to be defective. So, I went to SparkFun with confidence that the hardware would be fine. I was right. I'm not great at soldering but it was fairly easy on the SparkFun board and I used it right away to program an Arduino Pro Mini - worked great! All the hardware I've purchased from SparkFun has worked fine. Thanks SparkFun!!! I needed a way to communicate with my PIC project over 3.3V UART signals. This board worked effortlessly. It works at 5V and 3.3V so I had to add a little solder to jumper a connection to set it to 3.3V. Simple! It runs at 115200 baud without a problem and is a big help in debugging my project.